Vermonters Stand Up Against the Windpushers! Vermont is the place where dreams of peace and tranquility come true. 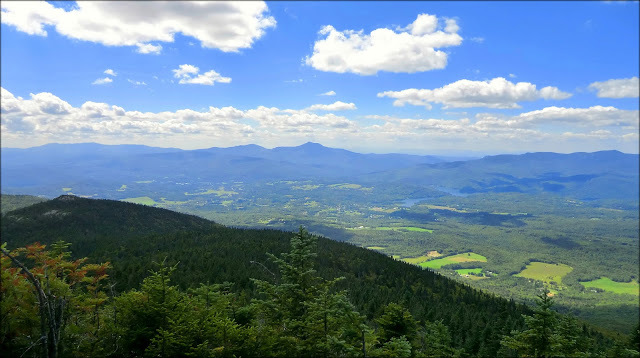 Rolling waves of verdant hills, interspersed with fertile valleys and filled with a tenacious band that endure bitter winters and short bursts of what those in America’s North-East think passes for ‘Summer’: that’s Vermont. But the element that’s brewed to the surface in the Green Mountain State– and that’s now reached boiling point – is unbridled anger. Vermonters are set upon by the same cowardly, callous and criminal chancers found all around the Globe – that appear from nowhere – like flesh-craving zombies – slobbering at the thought of massive and (seemingly) endless subsidies. 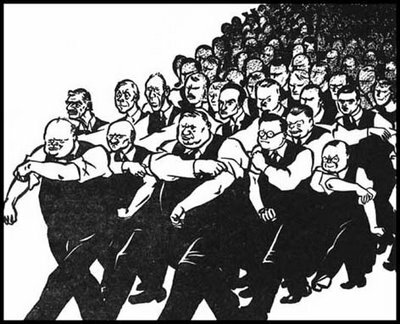 While their so-called political betters dance to their back-handing benefactors’ tune, the communities set upon have risen to the point of a full-scale, open rebellion. The following pieces tell the story of a mass movement of Vermonters venting fury and of a few politicians gifted with grace (rather than beguiled by wind industry ‘grease’) who’ve decided to put a halt to the most ludicrous energy ‘policy’ ever imagined. On Wednesday, more than 100 protesters gathered at the Statehouse to demand local control for energy siting. Leading the demonstration were state Sen. John Rodgers, D-Essex/Orleans; Karen Horn, policy director for the Vermont League of Cities and Towns; and Don Chioffi, a member of the Rutland Selectboard. Together they argued the energy project siting process as it now stands oversteps the will of ratepayers. “I would like to acknowledge those here today whose homes and lives have been sacrificed by our state’s energy policy, those of you who have been encroached upon and bullied by energy developers, and those of you who have lost not only property values but the health of your families to industrial wind plants. The process that we use to site energy in Vermont is broken and it’s long past time to fix it,” Rodgers said, opening the event. To that end, Rodgers is sponsoring S210 and a slew of of other bills to ban industrial wind and subject the Public Service Board’s energy development certification process to stipulations found in Vermont’s strict land use and development law. Other community leaders, including Chioffi, offered comments about the problem. Mark Whitworth, board member of Energize Vermont, a pro-renewable energy group, attended the event to protest the manner in which renewable energy projects are being implemented. 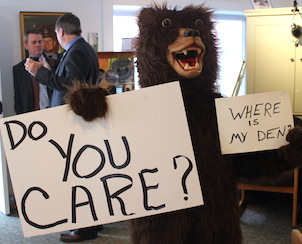 Vermonters from across the state traveled to the Statehouse to have their voices heard as well. Whitworth explained what it means for a town to be part of the rebellion. “These towns have either signed onto the Rutland resolution or they’ve adopted town plans which have explicit language regarding energy citing or certain energy technology,” Whitworth said, adding that his town of Newark has a town plan that says industrial wind turbines are inappropriate. Currently, energy projects are exempt from Act 250 requirements. These requirements include adhering to regional municipal plans not unlike those of Newark. Rodgers’ bills attempt to make energy development subject to the same requirements other commercial developers face. The plan is certain to hit resistance, largely because of the money involved. Chioffi said public money, including federal subsidies of 30 percent and state subsidies of about 8 percent, is what drives these projects. He argues that a 40 percent up-front return is also fueling the green energy rush. Whitworth said the state’s renewable portfolio standards — which require every municipality to periodically increase its percentage of renewable energy sources — is another driving force. “It really lit a fire under this,” Whitworth said. He added that while there are no current calls to freeze or repeal Vermont’s RPS, he thinks if legislators don’t respond to the pushback from communities, that will change. At least four of 29 states with such standards have halted or repealed them. When asked about the status of Vermont’s RPS, Rodgers expressed concern about the economics of renewable energy. “There are a huge number of manufacture and installation jobs with solar today — I think it’s like 16,000 jobs,” he said. “The problem is, after the construction, we have basically set up a pipeline of our cash out of state because most of the owners of the big installations are out-of-state people or corporations. “So it’s basically taking the tax credits out of state and the ratepayer money out of state. If we were building more on Vermonter’s homes and businesses, the tax credits and savings would stay more in Vermont” Rodgers said. 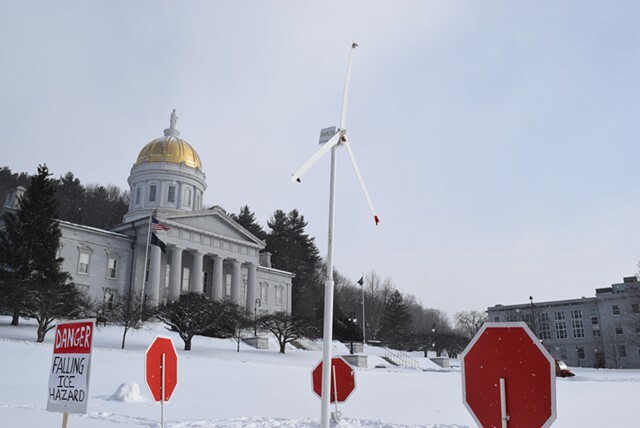 The makeshift wind turbine erected in front of the Statehouse, emblazoned with the governor’s last name, was the first hint. Then there were the sign-bearing protesters flanking the Statehouse doors. 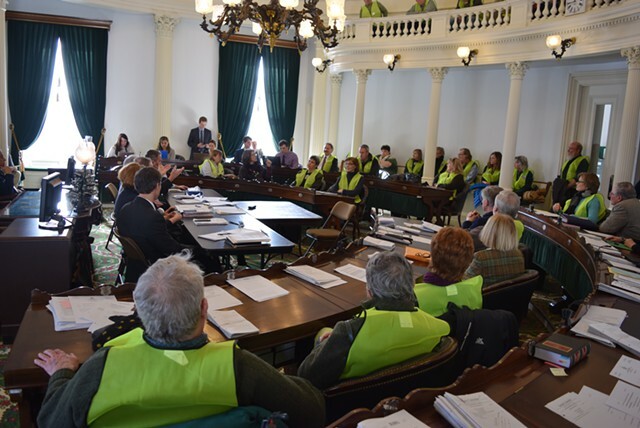 Inside, in the halls of the Statehouse, the cafeteria and committee rooms, scores more were dressed in bright green vests to highlight their presence and emphasize the danger they feel. Wednesday brought the biggest show of force yet by Vermonters upset with the state’s siting process for energy projects. What has in recent years been a relatively small group of wind opponents has grown into a legion of people worried about wind and solar, including town leaders from across the state. “Now, it’s being taken more seriously,” LuAnn Therrien said of the opposition. Therrien has spent years speaking against the Sheffield wind project, which she said drove her family out of town. The proliferation of solar projects around Vermont has changed the volume of the opposition, said Mark Whitworth, who is with the organization Energize Vermont. The group has long opposed decisions about the siting of wind projects, and it now finds new friends opposed to suggested solar sites. “That is what really has lit a fire under this energy rebellion. When it was wind in the Kingdom, it was pretty easy for people in other parts of the state to ignore it,” Whitworth said. Wind and solar siting opponents filled the Senate chamber. Now, many town officials are also fired up. The Vermont League of Cities and Towns, not exactly a rebellious organization, joined in Wednesday’s event. Nearly a dozen local officials testified to legislative committees about how their towns have spent thousands of dollars and still feel powerless during the process to determine renewable energy sites. Whether this growing throng of rebels will get their way is another matter. While they are railing against what they consider poorly sited projects, Gov. Peter Shumlin has been touting the growth of renewable energy and the jobs it brings. Wednesday’s events — hours of meetings with the Senate and House Natural Resources and Energy committees and a noontime press conference and rally — were organized by Sen. John Rodgers (D-Essex/Orleans), author of a bill calling for a ban on industrial wind projects. Prospects for a ban seem as weak this year as in previous years, however. “We’ll listen, but I think the problem with that proposal is we have an orderly development process,” said Sen. Chris Bray (D-Addison), chair of the Senate Natural Resources and Energy Committee. Bray insists, though, that he’s working on changes that will help, at least on the solar front. “That is the most urgent need we are responding to,” Bray said. His committee is putting together a bill — S.230 — that he hopes will offer incentives to build solar projects in specific locations and direct the Public Service Board to consider town plans in approving projects. Changes coming to the state’s net metering regulations will also likely slow down the proliferation of solar projects, he said. This video pulls together reports on the uprising from Burlington Free Press and NewsChannel 5. MONTPELIER, Vt. — More than 100 Vermonters turned out Wednesday at the Statehouse to demand changes in the law governing the siting of industrial-scale energy projects. At noon, the noisy crowd jammed into the Statehouse gallery to cheer Sen. John Rodgers, the Essex-Orleans Democrat who has introduced Senate Bill 210. Rodgers said Vermonters resent a system which allows wind developers who stand to earn millions from turbines to hire lawyers to argue their case before the Vermont Public Service Board — while citizens most impacted and the towns that host the projects have little voice and no veto power. S. 210 would make a second key change, shifting permitting for renewable energy projects from the PSB to district environmental commissions and the development review process known as ACT 250. Supporters think Act 250 would provide citizens a far better shake. 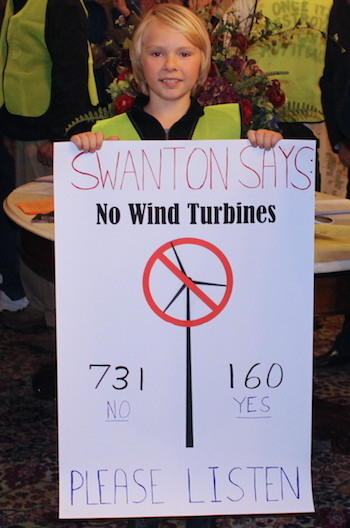 Anthony Iarrapino, spokesman for Swanton Wind, a proposed turbine project in Franklin County, said the criticism was unfounded. “If you look at the polls and the success of the projects we have (in Vermont) the majority of Vermonters understand how important wind is to our economy and getting us to clean energy goals,” he said. Paul Burns, executive director of the Vermont Public Interest Research Group, said the state’s goal of securing 90 percent of its energy from renewable sources will mean Vermonters have to get used to seeing turbines on mountaintops and large solar arrays in farm fields. S. 210 has been referred to the Senate Natural Resources Committee for consideration. That Vermonters are furious about the destruction of their thriving and healthy communities in ‘exchange’ for a wholly weather dependent power source; that’s intermittent and unreliable, requiring 100% of it’s capacity to be backed-up 100% of the time by conventional power generators; that, accordingly, has NO commercial value (save the massive power consumer and/or taxpayer subsidies it attracts); kills millions of birds and bats; and, with the incessant low-frequency noise and infrasound it generates, drives people mad in their homes, or drives them out of them altogether, is hardly a surprise. What the wind industry hates most are facts. And anyone with the temerity to present them is targeted in a style and with a zeal that would have made the East German Stasi proud. Here’s just another example of the wind industry’s standard tactics. The state attorney general’s office has opened an investigation into criminal complaints against a prominent champion of Vermonters who are adversely affected by renewable development. The attorney general’s office is investigating whether Annette Smith, executive director of Vermonters for a Clean Environment, has practiced law without a license — a charge with penalties left entirely to the court’s discretion. Smith says the complaints that prompted the AG’s investigation are politically motivated. Attorneys who have argued against Smith’s clients say she gives bad advice, unconstrained by the sanctions licensed attorneys would incur for similar behavior. Residents who live near planned and existing renewable projects have claimed she’s their only advocate. Smith said she represents people who too frequently have nowhere else to turn. Renewable energy developers hire talented attorneys against whom landowners near project sites have no other way of successfully representing themselves. Many of these cases involve people who can’t afford a lawyer, and who didn’t want to become involved in legal proceedings to protect their interests, she said. Lawyers know it’s impossible to fight renewable energy developers, Smith said, and won’t take on affected landowners’ cases anyway. The attorney general’s office would not offer comment on the case. “There is a matter under investigation by the criminal division, and we can’t comment on it further, and we never comment on ongoing criminal investigation,” said John Treadwell, Chief of the Criminal Division at the AG’s office. Practicing law without a license is a charge that has rarely been prosecuted in Vermont, Treadwell said. It carries potentially severe penalties. “It is punished as criminal contempt of the Vermont Supreme Court, and is potentially punishable by fine or imprisonment or both, in the court’s discretion,” Treadwell said. “In the court’s discretion,” Treadwell said, means there are no maximum defined penalties. Assistant Attorney General Zachary Chen named five cases in a letter notifying Smith of the investigation, and two attorneys were involved in both cases. Smith said one of them had previously accused her of practicing law without a license. Both have given Smith reason to believe they’ve sought to instigate an investigation against her, she said. Joslyn Wilschek is one of the attorneys, and in a previous Public Service Board hearing she told hearing officers that Smith had been in that instance practicing law without a license. Non-lawyers aid participants in legal and other proceedings all the time to good effect, Wilschek said, but Smith represents herself as having training that she actually lacks. “She gives legal advice to landowners, and she drafts their filings to the Public Service Board, and I think it’s a real disservice, because she puts herself out there as having the knowledge of a lawyer, when she doesn’t,” Wilschek said. Wilschek said she didn’t file a complaint against Smith with the AG’s office, but said she supports it and said that if asked, and if her clients consented, she’d testify Smith had done what she’s been accused of. Wilschek said her remarks reflect only her personal observation, and not her clients or their positions. People who Smith has assisted say they have no other effective advocate, and say they’re shut out of the hearing process for renewable projects by the excessive legality of the proceedings. “What she does is she provides citizens — normal, everyday citizens in the state of Vermont — with a possibility of having any chance at participating in the Public Service Board process,” said Christine Lang. Lang, with her husband and with Smith’s assistance, is attempting to persuade the Public Service Board to assess penalities on prospective wind developer Travis Belisle for constructing a meteorological tower without a permit. 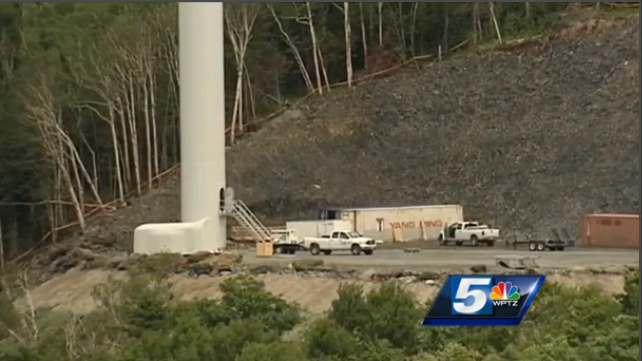 The met tower is a precursor to the wind turbine development project, and she says a permit filed with the board would have given the public advance notice. State agencies and developers are well-represented by lawyers at Public Service Board hearings, while ordinary citizens are shut out of the process, Lang said. “I think it’s a witch hunt to distract her from the work she’s trying to do to help citizens, because she’s the only one out there who’s helping citizens,” Lang said. “Does that make sense I should have to have an attorney to participate in what is supposed to be a public process? Leslie Cadwell, another attorney who has represented wind developer David Blittersdorf, says Smith has led her clients to bad ends. Cadwell participated in a case against Smith that complaints with the AG’s office have highlighted as representative of Smith’s alleged illegal behavior. “As a result of Annette’s participation in a case she was involved with before the Public Service Board, the town of Irasburg has violated open meetings law twice, and has admitted it,” Cadwell said. Professional ethical standards lawyers abide by prohibit this kind of behavior, Cadwell said. Vermont is one of few states that allows lawyers to work as clerks in lieu of law school as a means of studying to become an attorney, Cadwell said. Cadwell said that she did not file complaints against Smith with the attorney general’s office. Annette Smith has absolutely no case to answer. She hasn’t represented herself to be legally qualified to practice law (to those she represents or anyone else); hasn’t raised a fee for her services; and hasn’t pretended to have qualifications that she does not possess. Instead, all she has done, is to have given collective advice to, and advocated for and on behalf of, people who simply cannot afford legal representation; and done so in ‘Mickey Mouse’ hearings before an administrative planning panel (the Public Service Board); which has no Curial authority – and all the Judicial formality of the process required to obtain a driver’s licence at the DMV. Planning panels and tribunals (indeed, Supreme and High Courts) hear self-presented plaintiffs, applicants and defendants on a routine and regular basis. It’s now so common as to be unremarkable – especially in planning cases. In Australia, and other common law jurisdictions, otherwise unrepresented litigants are entitled to have what’s called a ‘McKenzie friend‘ represent them in courts of law. The McKenzie friend openly gives legal advice and assistance in and out of court; and does not need to be legally qualified to do so. The crucial point is that litigants in person are entitled to have assistance, lay or professional, unless there are exceptional circumstances. Provided the McKenzie friend does not represent themselves to be legally qualified to practice law and doesn’t charge for their time (although charging for time is permitted in England and Wales), there can be no complaint from the court hearing the case, other parties or their lawyers about them giving advice, assistance and otherwise advocating for the litigants they help to present their cases. Given the fact that there is no obligation on litigants, in any forum, to retain and pay for the services of a qualified lawyer, the charge against Annette Smith is pure, unadulterated nonsense; and is nothing more than the usual bullying, stand-over tactics employed by the wind industry and its parasites – tactics that see its goons beating up on pensioners, disabled farmers and middle-aged mothers. With its ham-fisted attempt to crush Annette Smith and the communities she helps to defend, the wind industry can expect nothing but fury and revenge in Vermont, from here on. 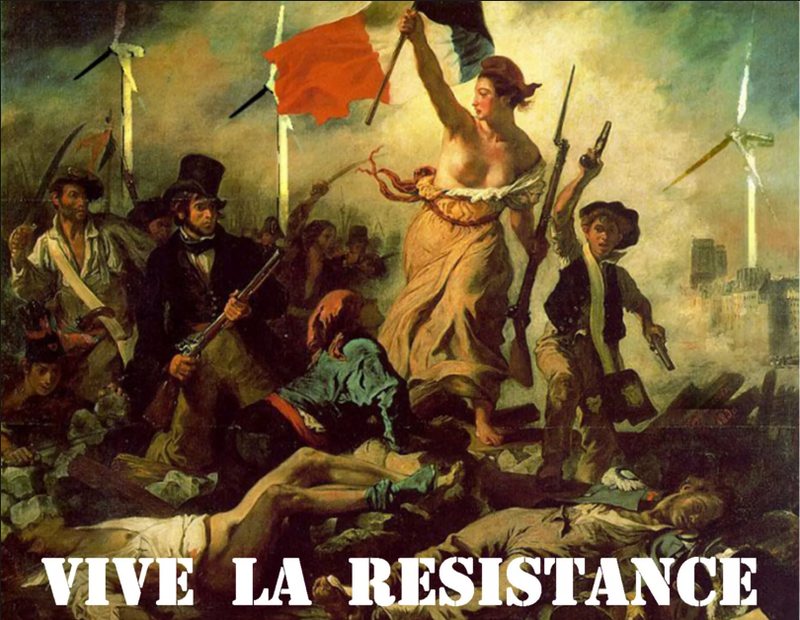 Let’s call it the beginning of a ‘revolution’.